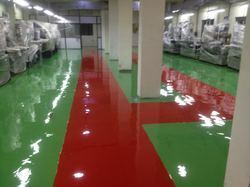 Prominent & Leading Manufacturer from Chennai, we offer high gloss epoxy self-leveling flooring and self leveling epoxy flooring. 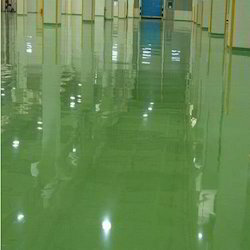 With long years of meaningful experience in the industry, we are able to supply and provide excellent range of High Gloss Epoxy Self-Leveling Flooring to our clients. Our floor epoxy self leveling products are offer excellent consistency and finishing with free flowing mixtures that provide easy application, supreme strength and long lasting functionality. You can now provide clean, hygienic, and dust proof surface to the floor by using Self Levelling Epoxy Flooring that is a 3 component self leveling epoxy having thickness from 2mm to 3mm. It is extensively used in pharmaceutical units, operation theatres, food factories, and also in TV picture tube manufacturing units and so forth due to its outstanding features. It is resistant to majority of alkalies and acids, anti bacterial as well as antifungal.